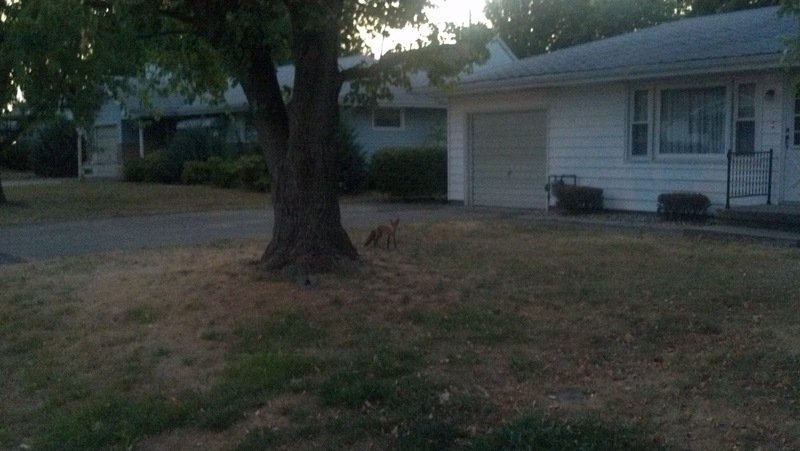 Early last week, I stepped out onto my porch to let my dogs out and noticed two foxes sitting on my lawn staring at me. When I say "fox", I'm not talking about the Megan variety, I mean I saw two Vulpes vulpeses, or, as they are more commonly known: red foxes. I wasn't completely surprised, as I had been seeing indications of their handiwork for the past month. The neighborhood had been attracting the attention of some turkey vultures due to a sudden increase in the number of rabbit carcasses. I knew SOMETHING was keeping the rabbit population down and I had heard some more distant neighbors mention fleeting sightings of foxes, but that didn't prepare me for seeing two of them on my lawn. And these foxes are quite large. I would have expected to see a pair of ankle-biters, but the foxes I saw would easily measure up to my knees. The pair of them stared at me possibly expecting me to throw them some scraps of food. It wasn't until my dogs barked at them that they sprinted off of my lawn and into a ditch two houses over. Red foxes are increasingly found in populated areas mainly due to the availability of food. It even appears that these urban foxes are evolving away from their rural counterparts to develop a taste for man-made food, an awareness of busy streets and a reduced fear of humans. I'm also told that it somehow results in urban foxes growing larger than rural ones. I managed to snap a somewhat blurry picture of one of the foxes last night. So far, they haven't been a disruption and have been quite the curious spectacle in the neighborhood.